In Community.Display of widgets in order of popularity. Put a cute, little, Japanese style review widget on your blog or in any article. Users are able to convey their opinion about the blog or article by entereing points out of a hundred into the widget. On the widget's website you can choose from two different styles. Get the code simply by putting the blog or website's URL and pressing the OK button. An interesting widget that provides a the time and date and more importantly displays images of recipes taken from the Japanese cooking SNS, Cookpad. 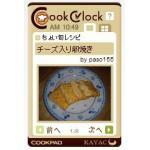 To get the recipes, some Japanese is necessary, but pictures are provided. To get the code, first go to the webpage, then click on the big orange button to the left of the image of the widget. On the next page, click on one of the four radials (top left: world recipies, bottom left:gorgeous recipes, top right: quick recipes, bottom right: inspirational recipes. Then click on the big orange button below that and the code will be displayed. Happy cooking! If you want a functioning chat room on your blog, this may be the widget for you. High quality chat room that is customizable to some extent. Change online name, audio, and transparency features. Website is in English. Simply add your site's URL, generate the code, and paste it into your site's HTML. Only drawback, there are some obvious ads on it. Here's an interesting way for you or your Blog visitors to leave messages on your blog. Just type in a message, select a face and then press the [伝言] (message) button and your message appears above the hamster and his expression matches the one you chose. Kind of neat. The code is easy to find on the widget's web page.